Residents gather to celebrate grand opening of new place at 3809 W. Vliet St.
Community members gather for the grand opening of the new Pete’s Pops storefront on the Near West Side. Photo by Robyn Di Giacinto/NNS. Tyvek wrap lined some of the windows of the new Pete’s Pops storefront at 3809 W. Vliet St. But even if the façade was still in progress, by early afternoon the business’s grand opening was already in full swing. The whir of passing cars and motorcycles was peppered by the beat of funk chart-toppers and the squeals of sticky-fingered children. The line for “The Pop Window” snaked out the door. Customers at the end peered through the open bay window at a huge blackboard scrawled with 24 different popsicle flavors. Pete’s Pops started in 2014 as a single pushcart selling five flavors. Now, the company has opened its first brick-and-mortar location, a formerly vacant 1,000-square-foot space that features a walk-up retail window and commercial kitchen. Near West Side resident Annie Harrell shares a sweet treat with her grandchild, KJ. Photo by Robyn Di Giacinto/NNS. Cooney committed to locating the storefront on the Near West Side in 2016 after winning $10,000 from the inaugural Rev-Up Milwaukee competition, a “Shark Tank”-style live pitch event organized by Near West Side Partners. The grand opening was originally slated for June but had to be pushed back to allow for extensive renovations. Annie Harrell, a Near West Side resident who has lived on 44th Street for the past 11 years, had been watching the progress of the store’s renovations for months. But she didn’t realize it was the grand opening until earlier that day, when she saw signs and a crowd of people while driving home from the grocery store. 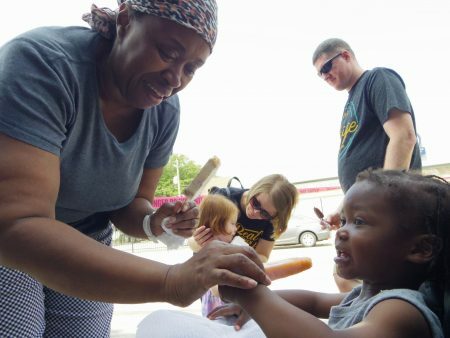 “It’s kind of exciting to have something different in the neighborhood,” she said as she held a popsicle for her young grandchild, KJ. Harrell added that she hopes to continue visiting Pete’s Pops as long as weather permits. On the other end of the sidewalk, Lionel Lin and Randy Torkelson echoed her enthusiasm. The longtime Near West Side residents said they first heard about the grand opening on Facebook and were eager to show their support for a new local business. So far, the store has hired seven local high schoolers as part-time employees. The youth approached Cooney about working for him shortly before the store’s soft opening on Aug. 11. 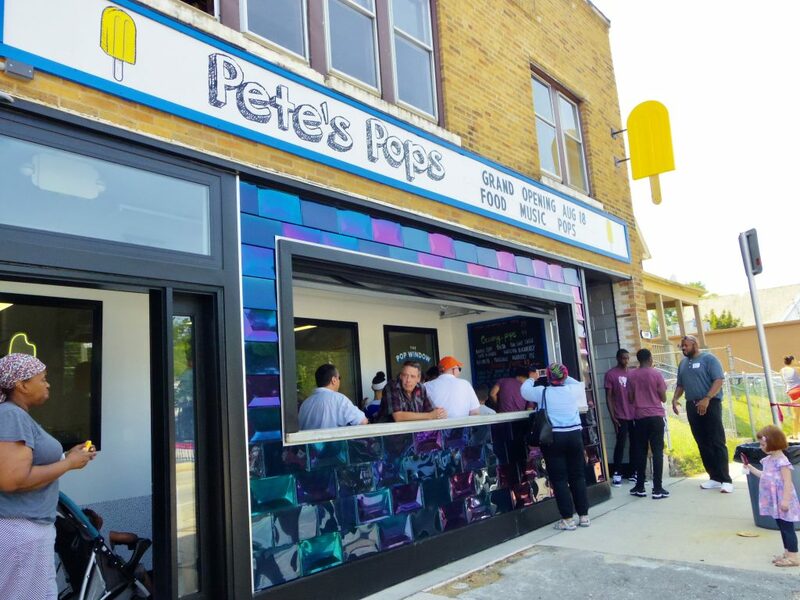 Pete’s Pops Vliet Street location will be open on Saturdays and Sundays from noon to 8 p.m. through the end of the season. Cooney plans to complete renovations over the winter and re-open next spring with both weekday and weekend hours. The business’ pushcart will continue to operate at farmers markets and other outdoor venues as usual.